Most ornamental grasses can be quite dramatic as they add a light airy look to the landscape, especially when planted in groups. These grasses have a different look - a bit more informal or maybe a little wild. Ornamental grasses are dynamic with the size, color, shape and texture changing as each season progresses. It is always a good idea to do some research before you decide to plant any ornamental grass, especially with regard to the mature size and spreading potential of each variety. Ornamental grasses have become popular for use in landscapes. Many are fairly drought tolerant, or tolerant of a wide range of conditions. Sand cord grass (Spartina alternaflora), for instance, will thrive in wet spots near both fresh and salt water. But if a drought comes, it does just fine without significant added water. The grasses that are most commonly seen in the nurseries are Gulf Muhly grass (Muhlenbergia capillaris), Purple fountain grass (Pennisetum setaceum 'Rubrum') and Green fountain grass (Pennisetum setaceum). The University of Florida has determined that Green fountain grass has invasive potential and should not be used in our area. Gulf Muhly grass grows in a clump about three feet tall. 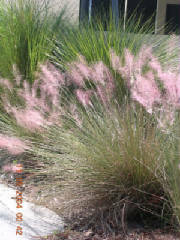 In the fall purplish pink feathery flowers cover each plant are a held high above the leaves. This grass is salt tolerant and very drought tolerant once established. Muhly grass can be pruned down to about twelve inches in February or just the ragged seed heads can be removed. Red fountain grass grows about four feet tall and two to three feet wide with lovely maroon leaves and tall arching seed heads. This grass can be sensitive to freezing temperatures. The whole plant should be pruned down to about eight inches high in February. This will remove any dead growth and old seed heads while encouraging rapid new growth. Others that I like are native grasses that may be a bit harder to find. Florida Gamma grass (Tripsacum floridanum) is sometimes called dwarf Fakahatchee grass. It is evergreen and grows two to three feet high by about four feet wide and has interesting seed heads. This grass is evergreen, likes full sun to part shade and is virtually free of pests. Elliott's Lovegrass (Eragrostis elliottii) is a low, graceful, fine-textured grass with beautiful, silvery-blue leaves and masses of tiny, delicate flower spikes. It forms clumps of narrow powder-blue foliage that rises to about 18-24" tall. The 3 foot tall flowers stalks rise in mid to late spring, opening into a buff colored haze of flowers that lasts into fall and winter. Plant this drought tolerant grass in full sun to light shade in well drained soil. Purple Lovegrass (Eragrostis spectabilis) has a similar profile to the Elliott's Lovegrass listed above. The differences are that the blooms are lavender and the leaves are green. Sand cord grass that I mentioned earlier is a large grass, so it is not for small spaces. It grows four to six feet high and wide, but it does make a statement in the right places. It is shown at the back of the picture of Gulf Muhly grass above. Coastal bluestem (Schizachyrium maritimum) is a smaller creeping grass with blue-gray foliage that dies to the ground each winter, but will come up again each spring. This grass grows one to two feet tall, and the creeping habit means this grass will spread. Another grass that is not native and is normally grown as an herb is Lemongrass (Cymbogon citrates). It is fragrant and elegant, growing to six feet tall. It requires moist soil with lots of organic matter and it is frost tender. But it has the added bonus that you can use it as a flavoring in cooking. Please reference the University of Florida/IFAS Extension publication, Selection and Use of Ornamental Grasses on the Internet at http://edis.ifas.ufl.edu/pdffiles/EP/EP23300.pdf for extensive information on the various grasses that can be used in Florida along with their mature size and appropriate region of Florida for growing them.